The options for great bicycling through this region are many. Cyclists wanting an easy cruise can simply ride down the hill and pedal on flat roads up and down the Lot and Cele river valleys, below limestone cliffs, looking over tobacco fields, sunflowers, medieval villages, dominating chateaus, and centuries-old mills. 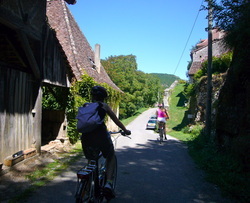 The road on the south (St. Cirq Lapopie) side travels close to the river in either direction. Or you can walk your bicycles to the top of the village, to the upper lot on the right, and take the road downhill toward Bouzies, through the beautiful, peaceful countryside. Just before you cross the river, you'll find a dirt path to the right. This takes you on a beautiful ride along the river. You'll share the path with hikers, so you may be ringing that bell, and there may be a puddle or two, or a rough patch when you're biking through the limestone caves, but it's a wonderful ride. Cyclists wanting a challenge can climb out of the valleys up 8-10% grades for fabulous hillside views, beautiful black-oak woods, and quiet pastures. The village is in the Midi-Pyrenees, which accurately describes the ascents — mostly moderate grades of 500-1000 feet (175-300 metres). The road from the river to the top of the village is a 10% climb and perfect for hill repeats. Rather than pay the high fees of some bike touring companies, you can wind you through some quaint villages and glorious terrain, to castles and vineyards, and beyond, with just a little advance planning. We're happy to help. There are a number of neighboring towns in which one can rent bicycles. Aficionados may decide to bring their own bikes. Either way, you'll have a blast. Use this link for a great website on bicycling in the Lot valley. It has some good information, though some of the routes are a bit far-flung from Saint-Cirq-Lapopie. For easy bicycling, you can just take off and head downhill along the river, You'll stay on mostly flat terrain, the topography is gorgeous, and there is very little traffic, even at the height of the season. Take a picnic lunch and stop along the way. It is absolutely delightful. Click on this link-- MapMyRide-- for a wide variety of bicycles rides in the general region, some short, some long, some very difficult (consider Maxime's electric bicycles if you want a little boost on the higher climbs). ​And this link-- Cycling the Lot Valley-- offers some interesting ideas for biking in the region. On the Lot Tourism website, you'll find additional bicycling routes and recommendations (this link takes you to the English language version).